On Feb. 9, the U.S. House of Representatives passed by voice vote an omnibus veterans bill (H.R. 3016) championed by House Veterans’ Affairs Committee Chairman Jeff Miller (R-FL). Although the bill includes a number of provisions supported by IAVA, it pays for them by taking funding from the Post-9/11 GI Bill. Specifically, the bill includes a 50 percent cut in the monthly housing allowance provided to children who have the Post-9/11 GI Bill benefit transferred to them by a veteran parent. Now this legislation is moving to the Senate, and the hard-fought benefits of 2.8 million post-9/11 veterans are at risk. Please stand with those who fought in Iraq and Afghanistan, many of whom continue to serve today, and tell your Senators you will not let the GI Bill be used as a congressional piggy bank. Nearly one million vets have benefitted from the Post-9/11 GI Bill, making it one of the most successful veterans programs in American history. 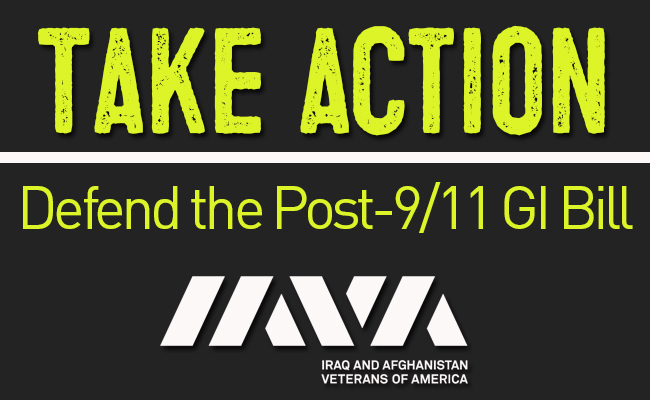 Help IAVA fight to protect education benefits for military members, veterans and their families!